Many pregnant women say that the first time they felt motherhood was when they heard their baby’s heart rate or when their baby started to move inside their belly. For many men, however, fatherhood, with all its roles and responsibilities, doesn’t begin until the baby is born or much later. 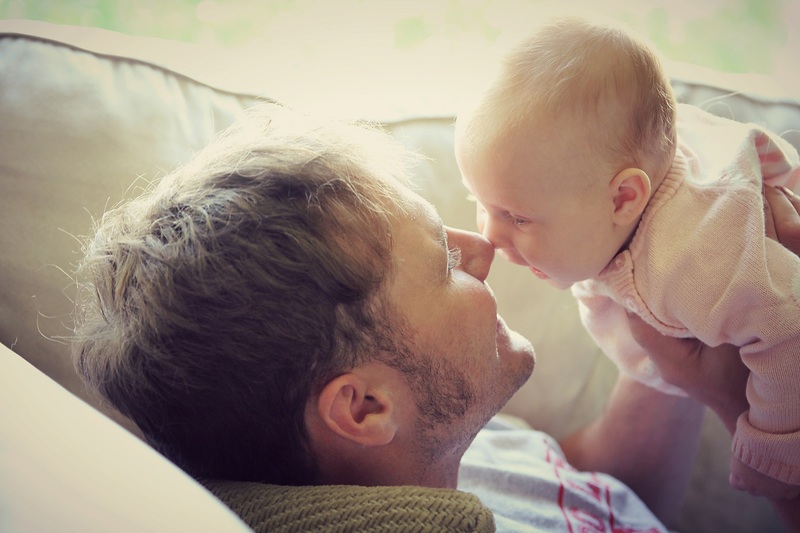 Most experts say that the fathers’ roles are as important as the mothers’ and that it is vital for new fathers to start bonding with the baby as early as possible. In this post, we will suggest a few useful tips for the new father, regardless of whether this is his first child or not. Spend quality time with your baby. No matter how busy you are, make time for your little one. Just like mothers hold their baby close to their chest, try the same kind of position. Spend at least two or more hours per day with your baby – there’s no better tip than that! Help at night. Your partner needs some time off from the baby and during the night might be the best time to bond with your little one. Yes, it is difficult to follow the rules and norms of feeding and changing diapers, but you will learn pretty fast. Night shifts alone with your baby will allow you to understand him or her better. Walk around with your baby. Babies (well, most of them!) like to be carried around in the arms of loved ones. If your baby starts crying, take him or her along for a walk or sing a song. Parental bonding should start at an early age and you will feel you are beginning to fulfill your fatherly duties as you soon as you start with the small things. Make eye contact. Infants recognize human faces and usually make eye contact. Make funny faces with your little one or just talk to him randomly, even if he or she doesn’t understand a word. Eye contact is extremely important! Play, play, play. Little babies love motion. They enjoy those bounces and jiggles more than anything else. If your baby is in a happy mood, try to hold him securely to make him or her comfortable. Use soft, colorful objects to play (and make sure your baby has no access whatsoever to anything sharp). Move your hands around, cuddle once in a while, and smile at him or her – you will feel the difference. Be a real man and change diapers! Yes, you read that right. Sharing responsibilities with your partner makes a great team effort and this includes changing diapers. Not only you will make your partner happy but also it help significantly with your baby bonding. Give your baby gentle massages. This is extremely good for infants when done with care. If you do not have experience giving your baby massages, ask your partner for advice and take your time to understand the right pressure to apply. It may take a while for you to feel like a daddy. However, as you begin this journey, following the small steps mentioned above will help you notice the difference. Remember: your baby needs your company more than anything else and, if you can give him or her enough quality time, the bond will start growing sooner than you realize. Lastly, make sure you take good care of your wife/partner too. She is most likely juggling many important tasks and needs a helping hand with the daily chores, now that the baby is finally at home. Should The Father Be Present At The Baby’s Birth?